If you have a CWP, you probably almost dread the day when you might have to pull your pistol and shoot. You’re trained to try to avoid situations where this might be a possibility, told not to look for trouble, and told to give loud warnings before the attacker approaches. But sometimes, no matter how careful you are, trouble will find you. And then, you have no other recourse, except to draw your pistol. You may not have to shoot, but you sure don’t want to be struggling to get to your weapon, regardless of the outcome. Incompetence in this area could make the situation worse for you, too. 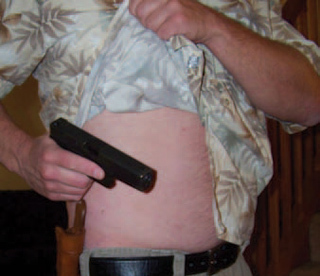 So, it’s important that you practice clearing the cover garments you wear when carrying concealed. To get to your pistol smoothly, there are really three steps – the reach, the pull, and the aim. First, reach across your body with your weak side hand and pull your shirt up high quickly. Make sure it’s nowhere near the weapon. Then, pull the pistol and point it at the intended target. It’s not that difficult, but if you don’t practice doing this, the weapon could hang up and be trapped – not something you want to have happen, but your reflexes don’t always work the way they should in stressful situations. He suggests that buttons should be avoided when possible or left open; to use a long zipper pull that you can easily grab, on a zippered jacket; and to use both hands at the same time, when dealing with snaps. Learning to use your gun and your mindset about handling stressful situations are important, but if you don’t practice getting to your pistol, it could mean the difference between life and death. Spend time practicing to get to your weapon, just as you do in learning how to aim and shoot it.